Looking for a program to measure how much time you spend on jobs, time chess games, or to prevent you freezing soft-drink cans? 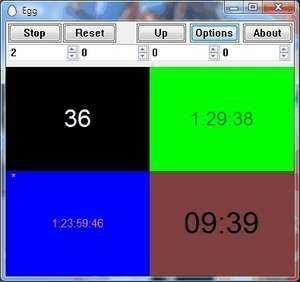 Egg is a very straight forward and easy-to-use timer that can do these tasks and more! It can count up and down, is settable by second divisions from 3 seconds up to 45 days, and while its default window size is compact, it can be varied to whatever size you want (including borderless full screen) to allow you to see the count from across the room. Egg can display up to four timers at once, with each one having its own time, font, colour (foreground and background), time-up sound and text, repeat and direction settings. Egg 1.6 is a shareware program and can be used as a demo to try the software until the free trial period has ended. A full version of the program is available after the trial period ends. For security reasons, you should also check out the Egg download at LO4D.com which includes virus and malware tests. Additional screenshots of this application download may be available, too.